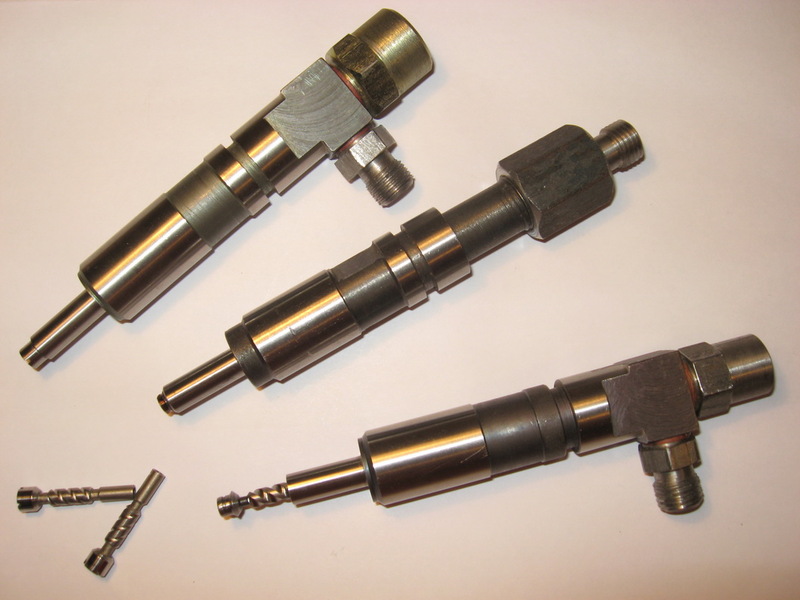 To diminish the diameter of atomized fuel drops and disperse fuel drops as evenly as possible along a combustion chamber, we came up with the usage of a valve fuel injector, which supplies Diesel or gasoline into a combustion chamber in the shape of continuous circle cone with an exposure angle of 50o – 180o. There is a gap between a valve and an injector housing; fuel enters a combustion chamber through this gap; its size is about 20 – 50 micron. During the process of fuel injection, an injector valve also vibrates and that leads to substantial fractioning of fuel. The cone fuel nozzle capitalizes Homogenous Chamber Combustion Ignition (HCCI) process in internal combustion engine (both engines – Diesel and Spark Ignition) by means of wide and equally dispersing the fuel throughout the entire combustion chamber. Decreasing jet holes of a fuel injector and their quality production can resolve by diminish diameter of fuel holes. However, dramatic diminishing of their diameter is impossible due to technological obstacles related to the holes fabrication process. Disperse fuel drops is resolved by selection of the most suitable combustion chamber and determination of the fuel stream direction in such a way that equal dispersion of fuel is provided among the entire combustion chamber. The number of holes can’t be increased indefinitely because of technological complexities. The newly developed nozzle of valve type supplies engine (both Diesel and spark ignition) with fuel directly into a combustion chamber. Fuel takes the shape of continuous circle cone with an exposure angle of 50o – 180o. There is a gap between a valve and an injector housing. Fuel enters a combustion chamber through this gap; its size is about 20 – 50 micron. During the process of fuel injection, an injector valve also vibrates and that leads to the substantial fractioning of fuel. File 1. 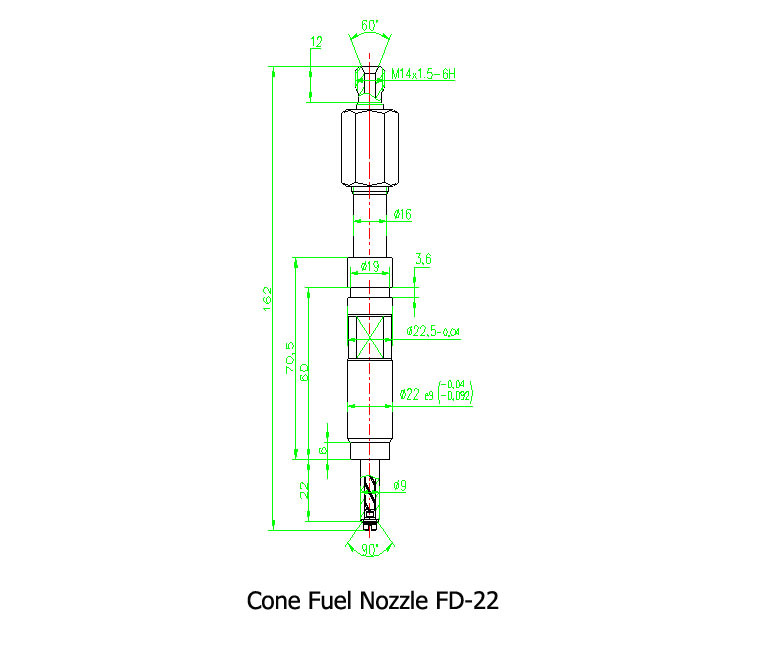 Cone Nozzle 2D.doc (or 1_1. 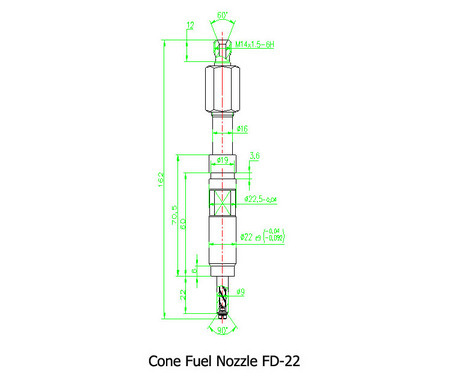 Cone_Fuel_Nozzle_FD-22.jpg) contains the schematic drawing of the nozzle. We have developed several designs of a nozzle based on the same fundamental of cone-shape fuel supply. Pictures of some nozzles are in file 2. Cone Fuel Nozzle.jpg. The nozzle in the middle corresponds to the best design that assumes axial fuel supply to the nozzle. This design does not have discharge system to get rid of residual fuel from the nozzle, and due to its special features the fuel cut-off occurs rapidly and without any fuel loss within “dead” (free) cavities that is very common for ordinary nozzle design. To verify an approach used for design of this type of nozzle we have conducted several experiments. File 3. Nozzle_1_2.jpg shows two typical results. Aim 1 shows the shape of the fuel distribution for the earlier nozzle versions. Such fuel distribution happens due to the high pressure that squashes a guiding part of the valve to a nozzle wall, so the entire fuel goes along one side only. After the modification of the nozzle guiding part design, the fuel distribution took the shape as it is shown on aim 2. Besides, there are some volume spots around the nozzle centre where fuel is not being distributed. In addition, there is no fuel outside the fuel distribution boundaries, which means the cone-shape fuel distribution takes place. It was visualized that the fuel distribution has the appearance of white fog, e.g. it comes in form of the fine-dispersed fuel suspension. Valve that locks the dispersing nozzle unit turns into a bar mounted with tightness to provide its opening at 1,200 – 2,000atm (120 – 200MPa) pressure. Additional lengthening of the valve bar takes place within the zone of plastic deformation, so the valve repeatedly seats on its bed during the injection process. The round injection torch has white color (typical fog color), e.g. there is no liquid component in the fuel torch. Such fuel fragmentation, – under conditions of certain surfaces roughness, a gap between valve cone surface and its bed, fuel pressure and frequent axial vibrations, – results in destruction of fuel molecules and its fragmentation. This process of fuel supply is of nanotechnology level. In accordance with the computations, the frequency of axial vibrations is no less than 100,000Hz meaning that during one injection the valve sits about 15 – 20 times at engine crankshaft frequency of 2,200RPM, which corresponds to 20 – 24 degrees of crankshaft rotation. The newly developed nozzle design allows introduction of additional voltage into the valve zone, e.g. creation of electro-magnetic zone to activate rarefied molecules and, as a result, to provide combustion that is more complete and to reduce harmful emission. We are looking for the Joint-Venture opportunity to advance the project in cooperation with any interested party like individual, automotive company, university or research institute, government agency or some from the above. Additional information and data clearing up the technology and approaches are available upon request.